(CNN) -- Premier League chief executive Richard Scudamore has slammed plans by FIFA president Slepp Blatter to impose limits on foreign players as "xenophobic rhetoric." Scudamore has strong views on the imposition of quotas for foreign players. 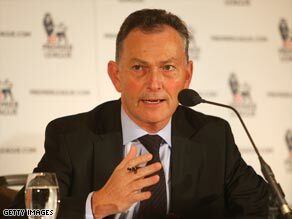 Scudamore stepped up his attack on Blatter's crusade for a six + five rule -- which would see a maximum of five foreign players in starting line-ups in the Premier League -- at the launch of an anti-racism initiative in London on Friday. The pair crossed swords over the issue at a FIFA meeting in Zurich on Monday and Scudamore did not pull any punches in his latest comments. "I do struggle where nationalism, jingoism and patriotism stops and where actually some sort of xenophobic rhetoric takes over," Scudamore told the Press Association. "I struggle with that when everyone bar David Beckham who is qualified to play for England at the top level is playing at home," he added. Blatter has taken his campaign for six + five to the European parliament and is pressing ahead with the initiative, despite warnings that it would be subject to legal challenges. He has also spoken out against the growing influence of the Premier League, fearing it will strip other leagues of their best players because of the money on offer to star players. But Scudamore, who also clashed with FIFA over plans for a series of '39th Games' for the Premier League clubs to be played outside England, is sticking to his guns. "We get accused of not being pro-English because we have so many foreign players, but we also have so many English players and they are playing against the best week-in, week-out. It is possible to be a world league and also an English league."